Well, I’ve been working on it for a while now, and I think it’s a fair assessment to say I’m a reasonably happy person. But happiness is a process, not a destination. I’m always learning how to stay on that path myself, as well as discovering new ways to help other people better understand and apply happiness tools. For example, in this course, I finally grasped the distinction between Positive Psychology research and the Science of Happiness. It’s not so hard — Positive Psychology, as its name makes clear, focuses on mental and emotional states. It’s very internal. Whereas the Science of Happiness includes much more physical aspects, like the effects of certain foods and the need for sufficient sleep. This distinction helped me appreciate that studying happiness is quite broad. 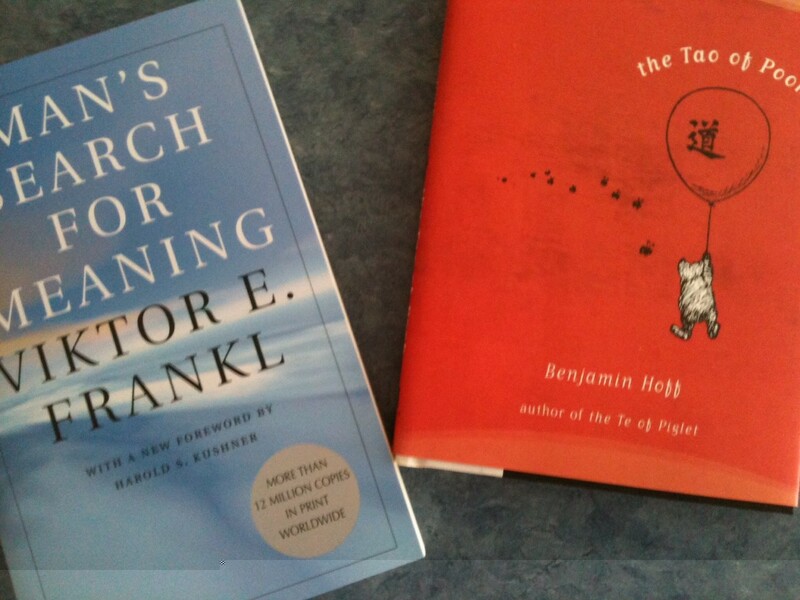 The two books I got that day further illustrated the breadth of happiness studies: from Holocaust survivor Viktor Frankl‘s seminal book, Man’s Search For Meaning, to Benjamin Hoff‘s light-hearted philosophical gem, The Tao of Pooh. Seeing them side-by-side amused me. The two books I needed for my online course in happiness. Not only was I clearly happier myself while immersed in this course, but I also got to study Mihaly Czikszentmihalyi work on “flow” — or, having an “optimal experience,” a time when we are so engrossed by our activities that we lose track of time. This flow can happen while creating art or working out or many other experiences. Learning provides great flow options, because flow can arise when the task at hand is somewhat challenging but ultimately doable. After reading about flow, I got to experience it! On the final day of class, we had to present happiness power points. Because I have never done a power point before, this was a challenging assignment. Of course it was doable, but it was enjoyable and meaningful. I spent many more hours creating my power point than I had allotted — hours that I look back on fondly. I was in the flow, and that is a happy space. In fact, though it was a lot of work, I miss the whole class — both the learning itself and our community of students and teachers (connection is, of course, another critical happiness piece). It was very special to spend the week in the online company of others who share my passion for happiness research. This cohort contributed to my learning through some rich discussions, especially on the topic of optimism (which is so valuable but can also veer uncomfortably close to denial). This wasn’t my first online happiness course. Last year with my daughter in Alabama, both before and after her baby was born, I studied “Sustainable Happiness” on my laptop — often with an infant sleeping on my chest. Here, too, I combined multiple happiness strategies — which is a good thing, because a third — sleep! — was in short supply. Another independent study experience that gave me great joy was learning to speak Latin American Spanish through the recorded Pimsleur method. The pleasure of learning was again enhanced by connection, as my husband joined me for most lessons. We were highly motivated to learn, because our son at the time had a strong relationship with a woman in Venezuela and her two children, whom we visited twice. I took pride in my achievements, deeply enjoyed the Spanish language, and had fun speaking Spanish with my husband. Sadly, after the Venezuelan relationship broke up, we lost our motivation. I still keep the CDs in the car with me, and keep thinking I’ll get around to studying some more … but it hasn’t happened. Maybe I should make that one of my happiness strategies that I measure. Devising accountability tricks (like stickers on a calendar) helps me stick with a new activity. Here’s something else I’m intrigued by: the multitude of online courses that are many universities are offering at no cost. I’ve read about this in the New York Times, and heard a great NPR piece on these courses last October when I was driving to meet Linda Wheatley and Paula Francis to join them for part their 600 mile Pursuit of Happiness Walk. Right before I hooked up with them, they had met with the Positive Psychology Center at the University of Pennsylvania — home to Martin Seligman, the father of Positive Psychology. Paula and Linda told me that those folks are considering offering some online courses through the free platforms. Exciting!